The National Kids Cancer Ride is one of the biggest and most ambitious charity cycling events on behalf of childhood cancer in the world. Now in its 10th year, the 2017 event began in Vancouver on Sept. 6 and wrapped up in Halifax 18 memorable days later. Riding in relay style, the selected national riders each cycled more than 200 kms per day, and were joined along the way by thousands of cyclists in major cities across Canada. 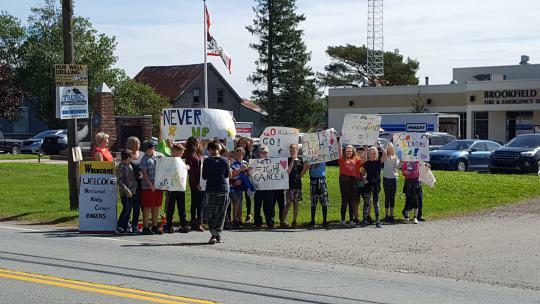 Grade 6 students from Brookfield Elementary offered their support to the riders by lining the streets and cheering them on when the cyclists visited their community on Sept. 22. The students designed, created and carried signs to greet the cyclists, and then wished them well as they set off on the next leg of their journey. Throughout the National Kids Cancer Ride, the Grade 6 students from Brookfield Elementary read the blogs of each of the riders, before meeting them in person when they were passed through Brookfield. It was an excellent experience for all of the students to meet such dedicated an compassionate individuals.